If you’re looking to throw a fun but unique party, then you’ve come to the right place for ideas. All you really need are a few simple ingredients, plus a great slew of people to make sure that you’re set and ready for action. Read on to see what you need for the best party ever. Once you have everything you need, make sure to send out invitations. This could either be online or the old-fashioned way, hand-written invites. What’s helpful about a hand-written invite is its staying value. People are more likely to hold onto it and see its importance if it’s a hand-written note. Next, this part is optional but fun, try and get a wine connoisseur in your midst. This will make it that much more fun to have wine there and someone who knows what they’re talking about. If you have plastic wine glasses, you won’t be afraid to mark them with anything and we highly recommend that you do. Take a permanent marker and write each person’s name on their respective glasses. This will make it easier for anyone who puts their glass down and needs to find it later. Having something like individual cheese knives will help keep the blue cheese where it needs to be and all the other cheeses on their own plates. If you decide to try a harder cheese, like cheddar, then using a wire cutter is a great option because it cuts through cheese very easily. Serve everything on a multi-tiered dish and you will be set in terms of entertaining. For an even more fun option, get different crackers, this will really give a different flavor to some of the cheeses and even the wine. 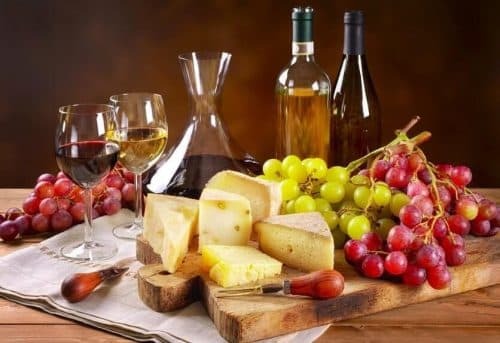 Let us know if you end up throwing a wine and cheese party in the comments below! And tell us how it went!